May 13, 1889 – The Secretary of War, Redfield Proctor, visits the site of Fort Sheridan, accompanied by a party of officers and gentlemen of the Commercial Club. The group is transported to the barren outpost by a special train that leaves the Northwestern station at Wells Street at 9:00 a.m. and returns at 1 p.m. The post commander, Colonel Lyster, meets the delegation at the north suburban station with an ambulance drawn by four government mules. The Chicago Daily Tribune writes, “The visit . . . was under circumstances most disadvantageous, the day being raw and the roads muddy.” [Chicago Daily Tribune, May 14, 1889] There isn’t much to see – “. . . one story frame barracks – shanties – and other buildings”. On the north end of the post the visitors are shown the proposed site for the commandant’s house. “Notwithstanding the gloomy day,” the paper reports, “the scene was inviting. The grove was blooming with wild flowers, and the angry swash of the turbulent lake many feet below was a recommendation of the spot superior to anything which had met the Secretary’s view during his Western visit.” If first impressions are everything, the new post falls woefully short. The report continues, “. . . it became apparent that construction of the post was not to be on that magnificent plan at first contemplated. The terra cotta pressed brick, the fine hardwood floors, the frescoed walls, and magnificence of palatial quarters had dwindled to plain yellow brick and papered walls. 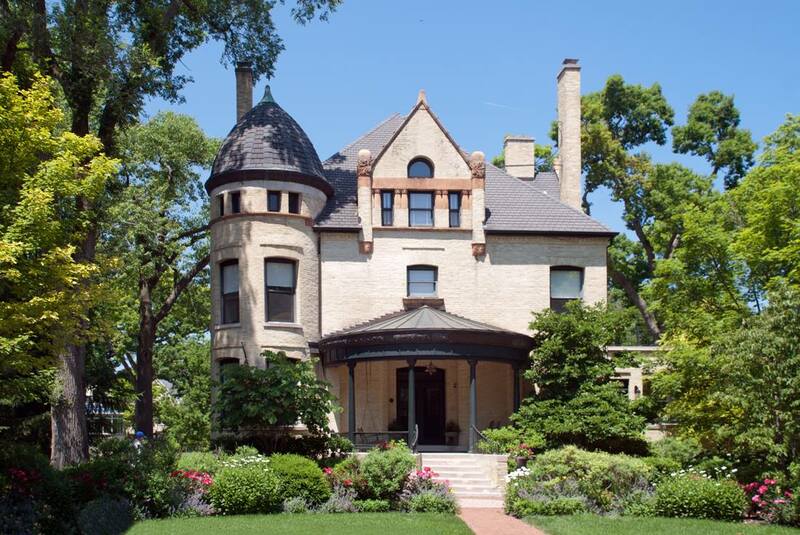 The commandant’s mansion had had a shrinkage from $30,000 to $15,000 and the contracts awarded yesterday called for only $2,000 more than the first appropriation.” The architects involved, Martin Roche and William Holabird, made it all work, though, and the Town of Fort Sheridan is a showplace today. The former quarters of the commandant appear above.